Serato DJ Pro and Serato DJ Lite are the latest additions to the Serato franchise and the successors to Serato DJ and Serato DJ Intro respectively. Just like any other Serato update, current Serato DJ license holders or owners of a Serato DJ Enabled controller will be fully compatible and no further authorization will be necessary. But, if you own a controller that only came with Serato DJ Intro/Lite, you can still upgrade to the full-featured Serato DJ Pro. This guide will show you how to start the 14-day trial, how to activate or start a subscription, and troubleshooting activation issues. When you connect a supported Serato DJ Lite controller, you can try Serato DJ Pro for 14-days free. Ensure you have your Serato DJ Lite controller connected. Open Serato DJ Pro. If the Trial pop-up does not appear on the bottom right, click on 'Start Trial' in the far bottom right-hand corner. Click the 'Start 14 Day Free Trial' button in the extended pop-up that appears on the right-hand side. Click on the 'Start 14 Day Free Trial' button again if prompted. All Serato DJ Pro licenses and expansion packs can be purchased as a subscription-based service. This offers a great way to get all the features and expansion packs of Serato DJ without having to commit to the full price standalone licenses. Three different tiers are available, each providing different combinations of Serato licenses. Download and install the latest version of Serato DJ Pro. Connect your hardware and choose MY SERATO, then EXPANSION PACKS & ACTIVATIONS. Choose 'Subscribe' under the offer most suited to you. When a trial expires, you will need to purchase a license to use your supported Serato DJ Lite controller with Serato DJ Pro. After successfully completing the purchase process, Serato DJ Pro will now be activated, and you can close the online window. You are able to activate Serato DJ Pro on one main computer, and one backup computer. Once you have activated the software, you can deactivate and activate your licenses by clicking the MY SERATO button in the license panel. Here you can deactivate Serato DJ Pro, in order to activate Serato DJ Pro on another computer. Click 'My Serato' near the top right of the Serato DJ Pro interface. Use your existing serato.com or whitelabel.net user account login email and password to log in. Select the 'My Products' tab and click on 'Activate' under the Serato DJ Pro tile. NOTE: If you receive an error code when activating, please contact support@serato.com, provide as much detail as possible, including the email you purchased the license with, and the error code or any information you received. You are able to activate your Serato DJ Pro license on one main computer and one backup computer. Once you have activated the software, you can deactivate your licenses by clicking the 'My Product' tab in the 'My Serato' panel in order to activate Serato DJ Pro on another computer. Check that you have deactivated your Serato DJ license from any older computers before trying to activate on a new computer. 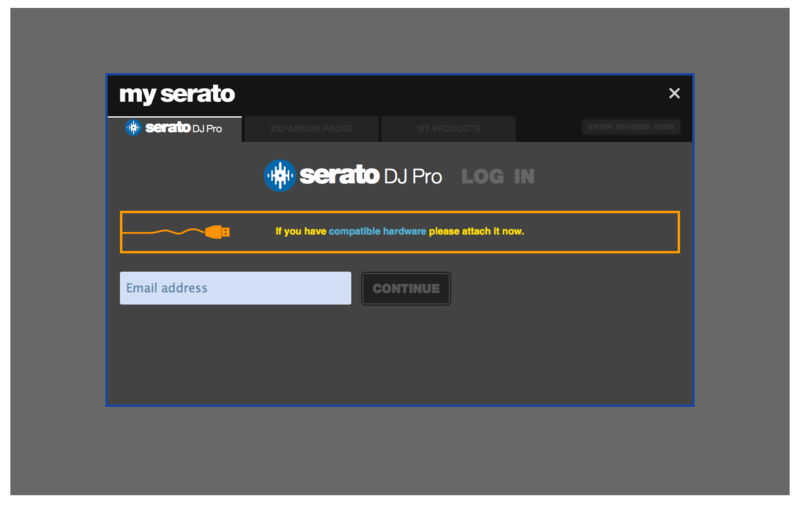 Make sure you are signing in with the same Serato.com account that was used to purchase the license. Make sure you are not exceeding your maximum license activations. Check that you have a stable internet connection. If you are experiencing network issues, turn your internet router off and back on again and/or try removing and creating a new network connection. Make sure your computer name or ID has not been changed. If you have changed the name of your computer or your user account on that computer than the license will no longer match the record and will no longer connect. If you have changed hard drives or any computer components since you last activated Serato DJ Pro, this can cause your computer to create a new System ID and will no longer connect with the record for your license.